I LOVE having a pieces of history in our home and being Christmas, I wouldn’t have it any other way. Let’s start with our tree. My lovely mother in law found this aluminum Christmas Tree at a garage sale last year. I was overjoyed when she brought it over! My friend’s mother gave me a box full of vintage Christmas goodies last year! The bulbs and this tree…. match made in HEAVEN! This year, I did find two new bulbs to add to the tree. This little Andy is a cutie! When it comes to tree “skirts,” I like to be different. (Imagine that) I was in search this year for a Coke-a-Cola create. I felt that the red from the crate would be the perfect combo. I couldn’t find one and settled on a Squirt crate. It works great. Side note, when I purchased the create, the next store I stopped at had a Coke crate. Sad Face. I also like to have vintage coffee and flour sacks on hand when I’m decorating. They come in handy, especially here! I covered the base of the tree with a vintage flour sack. I like this paired with the rustic crate. To top my vintage/retro vignette off, I added a Radio Flyer scooter! The red is so vibrant. The contrast of the red in this all white room is my go to decor move. I love popping browns and black against white, but with Christmas, I used red! Not my normal home decor color. My whole Christmas theme this year was neutrals with pops of red! Be sure to check out my Holiday Home Tours, Part 1 & Part 2. The poster behind the bike? My neighbor just gave that to me! He and his wife were moving and they filled my arms with lots of antiques and vintage goodies. It was like hitting the lotto in my eyes! This poster is so cool and fits well in this room. How sweet of him?! This room is now my favorite in the house! Up next, Pocketful of Posies! Be sure to stop over to her beautiful tree. Sara!! This is the most cutest tree vignette ever! I love the vintage, retro aspects and am loving all the extra goodies around the tree. I can’t even take the radioflyer scooter. So adorable. Great job. 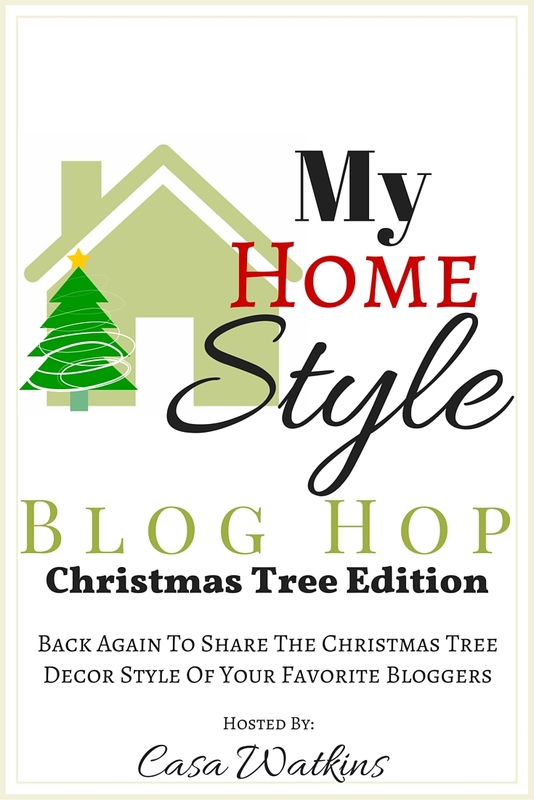 Thanks for participating in the My Home Style Blog Hop! Pinning and Sharing. Sara- this vignette is fabulous! Love every single piece of it. I can see why it’s your favorite! Those vintage ornaments have so much personality… Pinning all of this! Thanks Shelley for stopping by and pinning! I just love those ornaments too, so much history and love. I will cherish them forever. Happy Holidays! What an adorable vintage tree! Love everything about it especially that great radio flyer! Thanks Susan. I’m glad I added the radio flyer. It’s a hit! Happy holidays. I love this tree! It reminds me of how my mom used to decorate our tree. Beautiful photos! I am a sucker for vintage decor! I love what you’ve done with that little nook. I think the antique scooter and poster totally make the space. VERY CUTE!! I love all the vintage elements and the white tree and colourful ornaments are so sweet!! Love your vintage tree vignette! I think the squirt crate is more interesting than coke, anyway. You are a lucky lady to get such great loot for free! I love this vintage look. I especially love the scooter. I got one for Christmas when I was 5 years old. Great job! What an adorable tree! I love the pastel colors of the vintage ornament, and Andy is so cute! The whole set up is just perfection! It’s been so much fun participating in this hop with you! Absolutely adorable decorations and that Radio Flyer is an awesome touch! This is such the perfect grouping! Love all of the elements you’ve added to your Christmas tree! The retro-vintage-rustic! Amazing! I love that tree! Absolutely adorable. Thank you Jenny!!! Happy Holidays! The Andy ornament is precious! So is the tiny tree by the radio flyer. To funny I just posted about my tree also… But yours blows mine out of the water i absolutely love it !!! You’re too funny! Well, thanks! I’m sure yours is beautiful too! Happy Holidays! I love your enthusiasm. I am a bit of a christmas-decorations fan myself. Every year we get a huge 9-feet tall tree and decorate it as a family. But what about other rooms of the house? Don’t we want a bit of a holiday cheer in every room? Of course, we do! It’s hard to stop ….. Christmas decorations are so cute and inspiring. I have to build in holiday deadline. No more decorating after December 5th or else! I don’t know what “else” is but it has to be something very severe to prevent transgression…. You’re too kind Eva! I totally agree, it is hard to stop, especially when you’re a home decor blogger! For me, after the home tour (blog) I’m done buying Christmas decor and decorating. Well, I might rearrange items because I’m ALWAYS doing that! I love that you’re passion is as big as mine! Happy Holidays. I love to see vintage things repurposed and brought back to life. This is a lovely Christmas vignette! I’m glad you love it too! Thank you so much Michele. I love that tree in your photo! While I was growing up my mom always set up a small trees in mine and my brothers rooms. My was a silver one. Your picture brought back so many wonderful memories! What a fun, color-filled scene you have created! I’ve always wanted a white tree! I love the color palette and your vignette around the tree is perfect! That is so adorable. I love vintage…of course, I AM vintage…LOL. I especially love the Radio Flyer. You are so lucky! All of those gifted treasures are insanely cool. The tree and the ornaments definitely were a match made in heaven. I love it all. Thanks Corinna! I will cherish these forever! You have hands down the best vintage style out there and I appreciate and love how you own it!